> McAfee > Is it time to replace your SIEM? Read this paper to help you decide if the time is right! 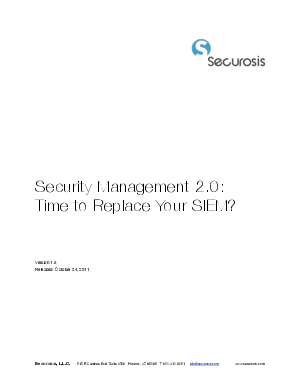 Security Management 2.0: Time to Replace Your SIEM? takes a brutally candid look at triggers for considering a new security management platform, walking through each aspect of the decision, and presenting a process to migrate – if the benefits outweigh the risks. Don’t assume that SIEM replacement is always the answer – that’s simply not the case. In fact, after this analysis you may feel much better about your original SIEM purchase, with a much better idea (even a plan!) to increase usage and success. But you owe it to yourself and your organization to ask the right questions, and to do the work to get those answers. It’s time to slay the sacred cow of your substantial SIEM investment, and figure out objectively what offers you the best fit moving forward.